Lecturer on history at the University of Zurich, Switzerland; born Nov. 28, 1867, at Glogau, Prussia. Caro received his education at the gymnasium of his native place and at different German universities, being finally graduated as Ph.D. from the University of Strasburg, Germany, in 1891. After a prolonged stay in Italy, where he sojourned chiefly in Genoa, he became privat-docent at the University of Zurich in 1896. As a result of his Italian experiences his writings deal principally with the history of northern Italy during the Middle Ages, with special reference to the republic of Genoa. 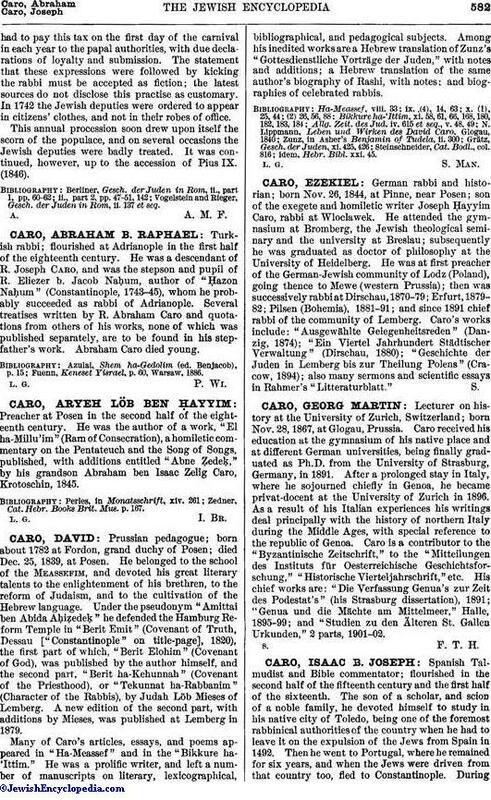 Caro is a contributor to the "Byzantinische Zeitschrift," to the "Mitteilungen des Instituts für Oesterreichische Geschichtsforschung," "Historische Vierteljahrschrift," etc. His chief works are: "Die Verfassung Genua's zur Zeit des Podestat's" (his Strasburg dissertation), 1891; "Genua und die Mächte am Mittelmeer," Halle, 1895-99; and "Studien zu den Älteren St. Gallen Urkunden," 2 parts, 1901-02.